Enjoy a Happy Hour at Home. A gorgeous pre dinner cocktail is all it takes ~ serve our Southern Beauty with or without alcohol. It’s a WOW ! drink. 1 Scoop out the inside of a watermelon and put pulp in large ziplock bags and freeze overnight. 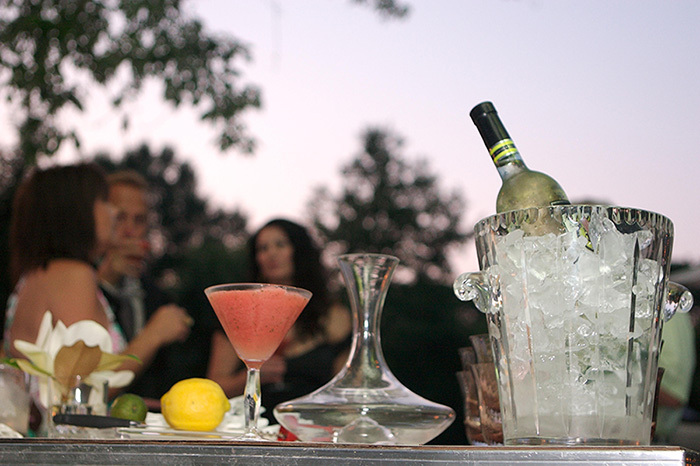 2 In a blender, add one bag watermelon, 1/2 can of limeade, handful of fresh mint, 1 cup of rum, and 2 cups crushed ice. Blend. 3 Serve in a martini glasses with a sprig of mint. invitation tied with twine can be hand delivered. Start everyone off with Wild Turkey Spritzer’s. Set creative crudites and dip on the kitchen counter. Put large coffee cups out for serve- it- themselves mushroom soup on the stove. Set your buffet on a butcher block or kitchen counter. Serve flank steak with bearnaise sauce, sour dough rolls, spinach and bacon salad, and frosted chocolate brownies. in a heavy over-sized plastic bag. Turn occasionally. 2 Cook on your grill or in a cast iron skillet. 3 Slice against the grain, on the diagonal. 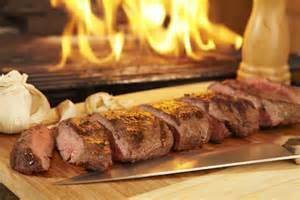 One flank steaks feeds 2 to 3 people. Serve on sour dough rolls with large dollops of bearnaise. 1 Preheat your oven to 400 degrees . Mix together flour, salt, sugar, and nutmeg. 2 In another bowl, mix egg, sour cream, and extract. 3 Add these to dry ingredients and mix well. Stir in apples and pour into partially baked pie shell. 4 Bake on cookie sheet for 15 minutes. Reduce heat to 350 degrees and continue cooking for 30 minutes more. Let cool, then add topping. 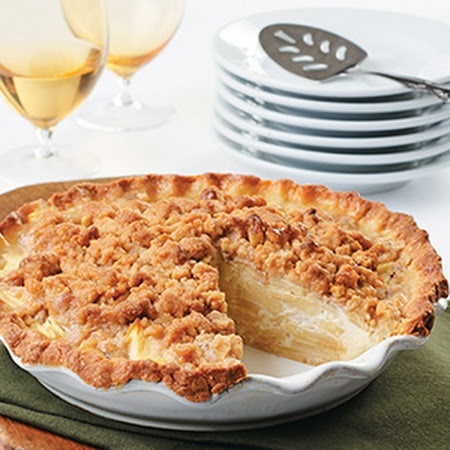 1 Combine ingredients until crumbly and place on top of apple pie. 2 Slide into the oven for 10 minutes at 400 degrees. 3 Take out and let cool. 1 Heat oven to 375°F. In large bowl, stir together cookie mix and crumbs. Stir in melted butter until soft dough forms. Press into ungreased 13 x 9-inch pan. 2 Bake 18 to 20 minutes or until set. Immediately sprinkle chocolate chips over crust. Let stand 3 to 5 minutes or until chocolate begins to melt. Spread chocolate evenly over crust. 3 Set oven control to broil. 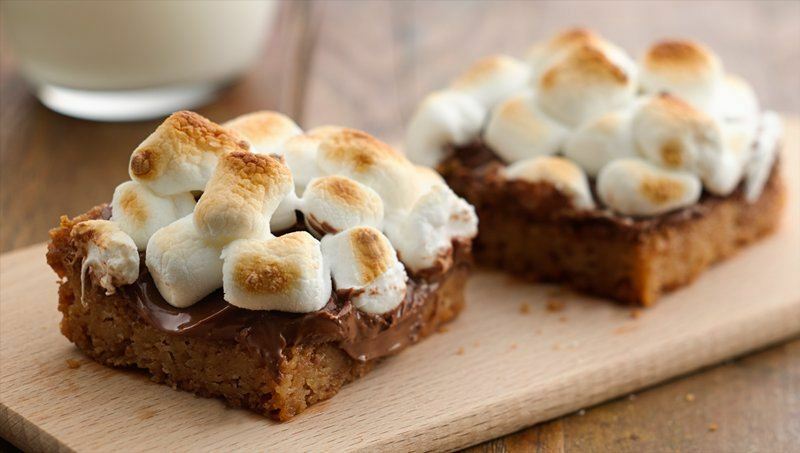 Sprinkle marshmallows over melted chocolate. Broil with top 5 to 6 inches from heat 20 to 30 seconds or until marshmallows are toasted. (Watch closely; marshmallows will brown quickly.) Cool 10 minutes. For bars, cut into 6 rows by 4 rows. Serve warm. Store any remaining bars tightly covered. Elizabeth Scokin, fashion darling and entertaining expert, shares her stylish recipe for a RED HOT tailgate party. Make a Chic Splash on Game Day! Kick Off your Tailgate with yummy Tortilla Spirals…one of the Haute Hostess’ favorites. Put big points on the scoreboard with this RAH! RAH! Whip the cream cheese and goat cheese together in a large bowl until smooth. Beat in all the remaining ingredients, except the tortillas and the oil from the sun dried tomatoes. Spread 1 tortilla with a large dollop (about 2 tablespoons) of the cheese mixture. Top with a second tortilla and spread in the same fashion with the cheese mixture. Roll up the 2 tortillas tightly like a jelly roll and wrap in plastic wrap. Repeat the process with the remaining tortillas and cheese mixture. Cut each tortilla roll into 1/2 inch slices and place on your favorite platter. Glamour Girl, Elizabeth Scokin, knows how to throw a posh little party, and a bit of “cocktail couture” is high on her list. Take a peek at the Haute Hostess’ refreshing and easy recipe ~ The Southern Beauty ~ for the secret ingredients to her favorite late summer cocktail . Scoop out the inside of a watermelon and put the pulp in large ziplocs. Freeze overnight. In a blender put one bag watermelon, 1/2 can of limeade, a handful of fresh mint, 1 cup of rum, and 2 cups of crushed ice. Blend. Serve in beautiful martini glasses with sprig of mint.